LEAGUE EVENTS INFORMATION The club competes in a number of league competitions which run throughout the year. The three league events we currently compete in are the Forth Valley Junior League, Swim West Lothian Splash League & Lothian Intermediate League. LOTHIAN INTERMEDIATE LEAGUE The league is held over three weekends at Prestonpans Pool and it’s a great team event which enables swimmers from all our squads to swim together. FORTH VALLEY JUNIOR LEAGUE The Forth Valley Junior League (FVJL) is a junior swimming league, with 12 participating clubs, run by a committee of parent helpers / club representatives. There are 6 galas from January to December, with the A and B finals taking place in December. On each event day, there are 2 galas. Each gala lasts 2 hours. All galas are currently held in our home pool in Bathgate. This is a great venue for these events as there is plenty of room poolside for all teams and a large spectator gallery to accommodate the large support at these events. There are a mix of relay & individual events. The events are time banded meaning if you swim faster than the time band the team gains no points. The idea is to help clubs introduce new novice swimmers to competitive swimming. 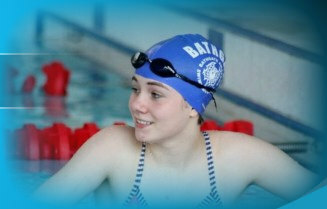 Bathgate where possible aim to include new swimmers in each heat throughout the year. We run regular time trials which help identify potential new team members. It is not always the case all swimmers get to swim individual events, some will only swim relays. Swimmers do not select their swims the team manager selects swims based on swimmers PB’s, event time bands & coach feedback. It is important in FVJL if you commit to attend you make every effort to attend or let the team management know if you cannot make it. To gain maximum points we need a full team in each age group to field relay teams in each event. Please remember that the FVJL galas are fun events and they would not be possible without parent helpers / volunteers. Each club hosts one gala each year and must provide 2 time-keepers per gala. Team Selection Procedure - The team manager selects the team based on the meet criteria, swimmers PB's and coach feedback. Selected members are given an invitation slip around 3 weeks prior to the event. This slip needs to be signed and returned to team manager before the closing date stated on the slip. Note it is very important if you commit to attend that you make every effort to do so or contact the team manger ASAP if unavailable so a replacement can be sought. SWL SPLASH LEAGUE The SWL Splash League is a team competition contested by the six SWL affiliated teams (Aquanauts, Bathgate, Broxburn, Fauldhouse, LDD & Trojan). There are four heats held through the year on a Friday night at St.Margaret's Pool, Livingston. The event was set up in 2012 with funding from the National Lottery. The event is run by parents from each club, help is required on the night from parents & club technical officials. The League provides an opportunity for club level swimmers to achieve accredited time in 50m/100m & 200m events. Splash League results are published on the results page of this web-site.